Potatoes are a popular crop in many Texas gardens. Most people choose red varieties, like the Red LaSoda, Viking, Norland and Pontiac varieties, but other soft-skinned potatoes, like Yukon Golds and Kennebecs, do well in Texas gardens, too. Texas is divided into growing regions similar to the USDA hardiness zones and the planting schedule is different for each one. Plant your potatoes in January if you live in regions IV and V, February for region III and March for regions II and I. Buy seed potatoes from your local nursery or garden center. Look for healthy looking potatoes about the size of an egg. Place the seed potatoes in a box or crate and set in a sunny spot for about a week so that the sprouts can grow. When you are ready to plant, remove all but the four sprouts closest to the center of the top of the potatoes. Prepare the planting area. Cultivate the soil with a garden fork to a depth of about 8 to 10 inches. Spread a 4- to 6-inch layer of compost and a 3-inch layer of sand over the soil and blend them in with the garden fork. Water the bed thoroughly and allow the water to soak in for about 20 minutes. Dig holes that are 5 inches deep with about 6 to 12 inches between each hole. If you are planting multiple rows of potatoes, leave about 32 inches of space between each row. 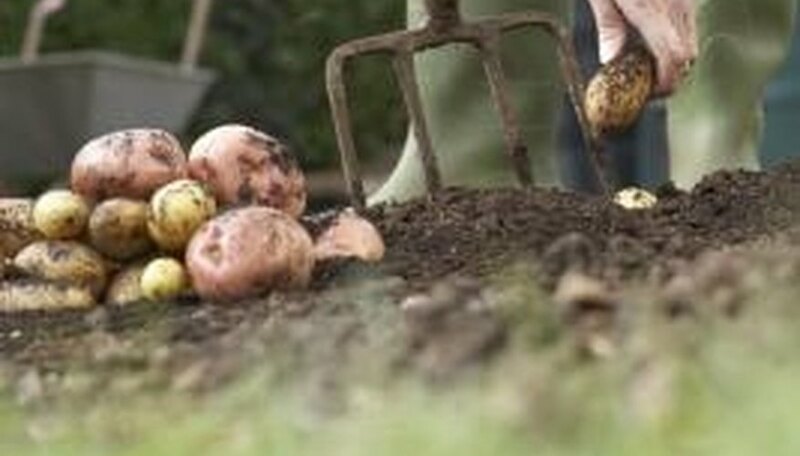 Fill the holes back in and then gather up the soil around each potato to create 4-inch tall mounds over each one. Water two to three times a week unless you experience dry weather. If you experience a drought, water daily. When the plants reach about 10 inches in height, gather up more soil around them so that only 4 inches of plant are visible. Add a small amount of compost to the mound and spread a layer of mulch to the top to help retain moisture. Repeat up to two more times until harvest season. Fertilize the potatoes once a month with a 10-20-10 formula fertilizer. Follow the instructions on the packaging for specific amounts to use based on the total area of the garden bed. Harvest the potatoes any time between late May and early June.